At MWC 2012, we didn't miss the opportunity to check out the newest Nokia applications that are about to be released on all Lumia handsets. 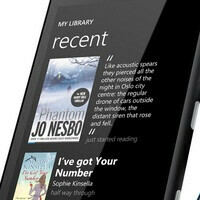 Nokia Reading is among these apps, and just like its title suggests, it works as a hub for magazines, e-books, and audio books. But that is not all that Nokia Reading can do. It can also work as an RSS reader so that you can keep track of all the latest headlines on the go. Furthermore, the app automatically arranges your feeds in a neat magazine style outlay for your convenience. The video that we have embedded below is a detailed demonstration of Nokia Reading and its features, so if the app seems like something that you would enjoy using, feel free to check it out. Of course, do not hesitate to share what you think about the app by dropping a comment below. This looks great! This is similar to Google Currents but goes a step further in functionality by adding the audio books. But how does Nokia and Microsoft expect to pick market share in the US for Windows Phone when they're making some of their best apps exclusive for countries outside of the US? Nokia is really setting itself apart with awesome hardware and exclusive software content. I wish HTC and Samsung would take note of this and give users that personal experience that sets their phones apart from other Windows Phones other than the HTC Hub and Samsung Now. Great job Nokia!